The Chart of the Day belongs to Community One Bancorp (COB), I found the southeastern commercial bank stock by using Barchart to sort the Russell 3000 Index stocks first for a Weighted Alpha of at least 50.00+, then again for technical buy signals of 80% or better. Since the Trend Spotter signaled a buy on 9/24 the stock gained 24.84%. 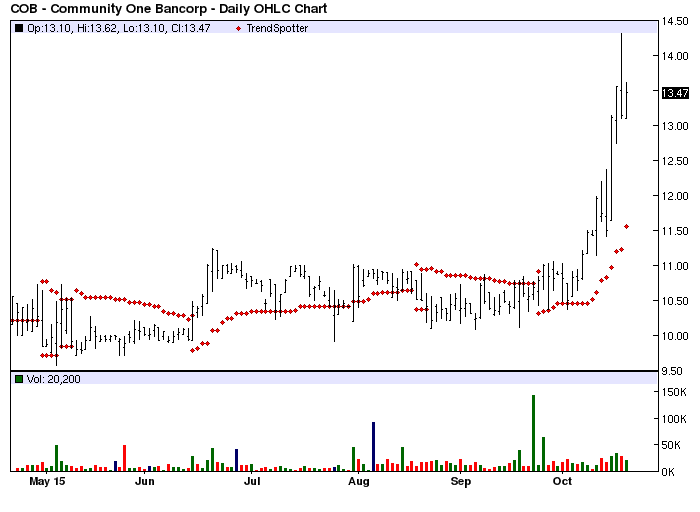 CommunityOne Bancorp is a bank holding company. It offers personal and commercial banking services which include loans, deposits, cash management, wealth, mortgage and online banking to businesses, professionals and individuals. The company operates primarily in Alamance, Alexander, Ashe, Burke, Caldwell, Catawba, Chatham, Gaston, Guilford, Iredell, Mecklenburg, Montgomery, Moore, Orange, Randolph and Richmond, Rowan, Scotland, Watauga and Wilkes counties in North Carolina. CommunityOne Bancorp, formerly known as FNB United Corp., is based in Asheboro, United States. The 50 Day Parabolic Time/Price indicator has been the most reliable technical trading strategy for this stock.